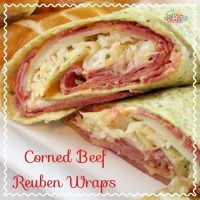 Corned Beef Reuben Sandwich Wraps Recipe! Corned Beef is one of my guilty pleasures! 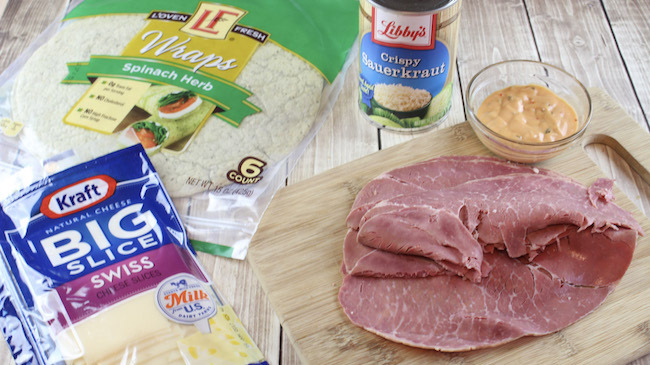 When you combine it with the yummy goodness of all the things that make a reuben a reuben – and snuggle it all into a wrap, you have a great lunch or even dinner. 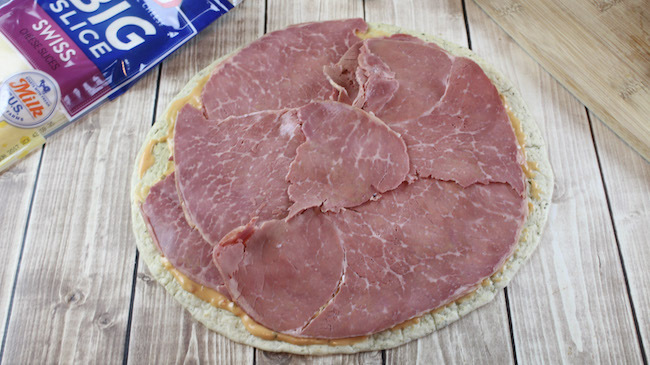 This corned beed sandwich is the perfect option for your St. Patrick’s Day celebration or for any time you have a “craving”. 1. Preheat oven to 350°. Line a baking sheet with parchment paper and set aside. 2. Place the tortillas on a clean and flat surface. 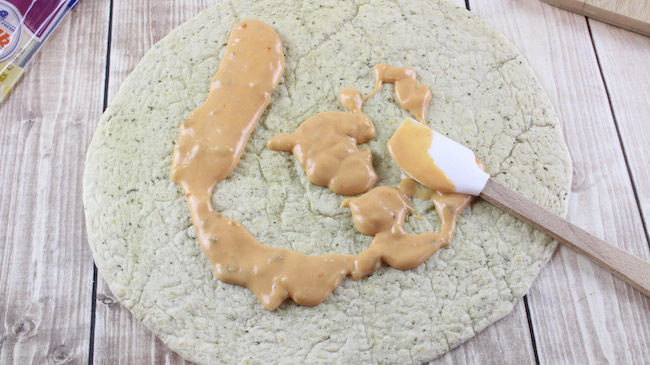 Spread the thousand island dressing on top of each tortilla, leaving about a 1/2 inch border. 3. Lay the corned beef on top of the dressing, followed by the cheese. 4. 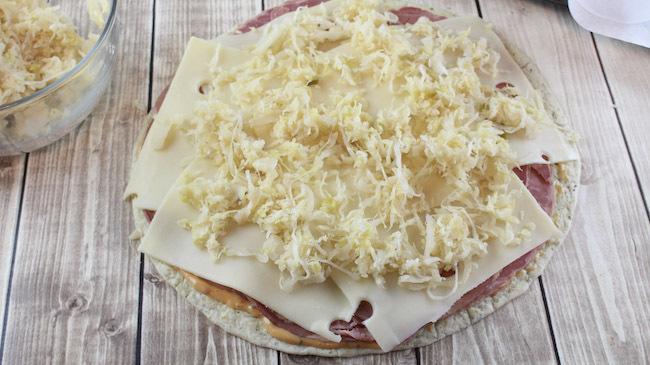 Sprinkle the drained sauerkraut on top of the cheese. 5. Gently roll each tortilla up, placing the seams down on the parchment-lined baking sheet. 6. 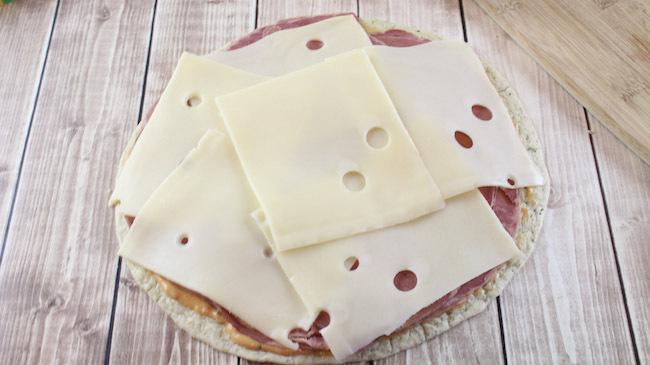 Bake for 8-10 minutes or until the cheese is melted. 7. Remove from oven and wait 1-2 minutes before cutting in half. 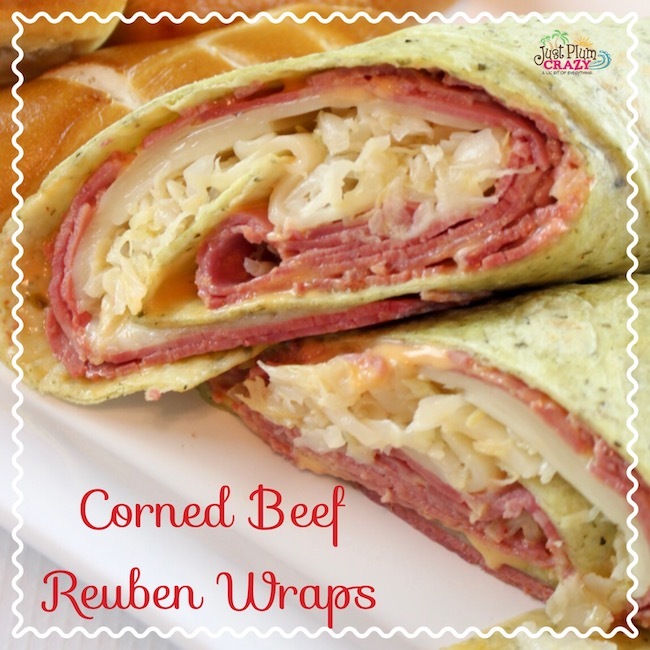 An easy to make Corned Beef Reuben Sandwich wrap that is a perfect snack for any event. Remove and let cool for 1 or 2 minutes. 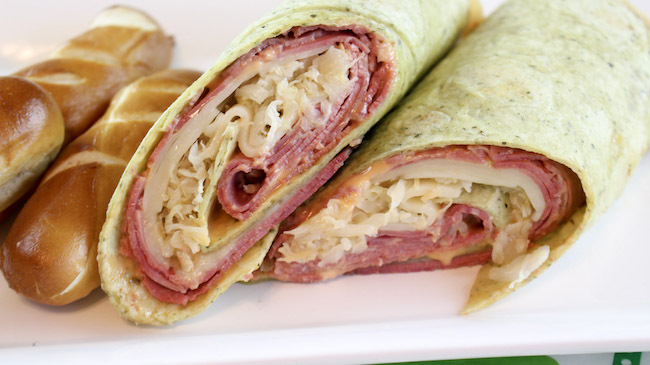 When I make these wraps I substitute the sauerkraut with coleslaw on some! You may be surprised how many prefer coleslaw - I know I do. Optional changes you can make to make it your own include changing out the sauerkraut for coleslaw, which is my preference for any reuben I eat. 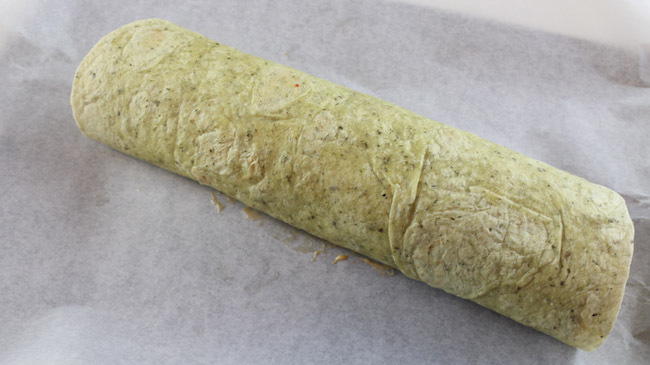 Also you can have some fun with the wraps as well – I used spinach for this recipe but whole wheat or some other tasty choice may be other great options as well! And lets not forget corned beef’s best friend pastrami! 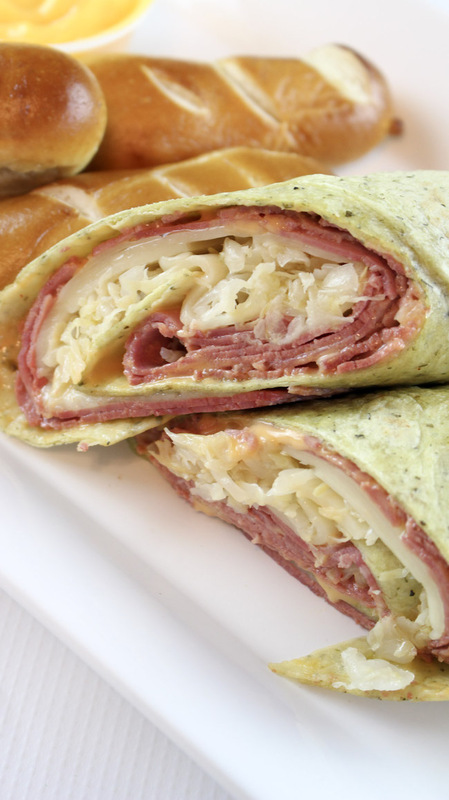 Pastrami is another great substitution to give this wrap a unique flavor. My favorite is iced pumpkin bread. I can deal with that in small doses.